You are currently browsing the tag archive for the ‘horse friends’ tag. These two characters often watch me from their turnout as I feed the Golden Girls. And being who I am, I always give them hay cubes. We have an agreement of sorts. They know me, and they allow me to get to know them. You may remember Shawnee from the time she had her bangs cut like Mamie Eisenhower. I wrote about it here. And Neighbor is a sweet old boy who has graced this blog many times. I don’t know what exactly they were discussing when I snapped this photo, but it looked intense. Maybe it was the clouds to the west bearing down on them. Or, where the heck the hay truck was. Or an evaluation of my pasture attire, which I’ll agree can be questionable at times. Whatever it was they were into it. Sometimes I worry that I see my horse friends more frequently than my human ones. I’m still trying to decide it that’s a problem or merely an observation. These two old guys – Joe and Parca are best friends. When you see one, the other is usually close by. Both are really nice horses. 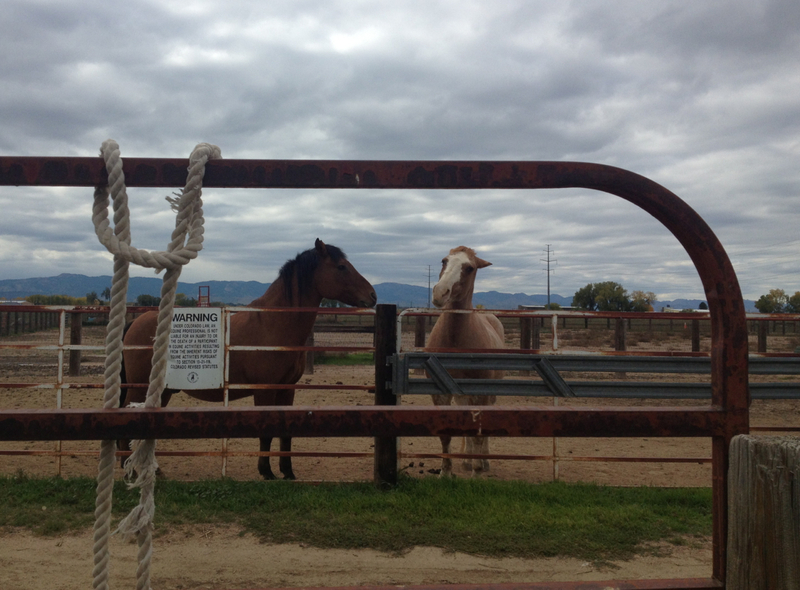 Parca, the retired rodeo horse, and Joe, the horse that’s taught hundreds of kids to ride. And have been around the block, so to speak. I took this picture on a day when the cold wind had stopped blowing, the snow was melting and the temps were edging into the fifties. It was a very good day to relax, stretch out on the ground and soak up the warmth. There wasn’t all that much sun, but it didn’t seem to matter to these two. They seemed content just to be together. I know exactly what it’s like to spend a leisurely afternoon with friends. Joe and Parca have inspired me to reach out today and thank at least one friend for being in my life. P.S. Thank YOU for being here, reading this blog! Bud and Amigo were friends. They usually hung out together in the pasture. Where one was, you’d find the other close by. So last week when I walked into the pasture to find Bud in distress on the ground, unable to get up, I also found Amigo close to him. 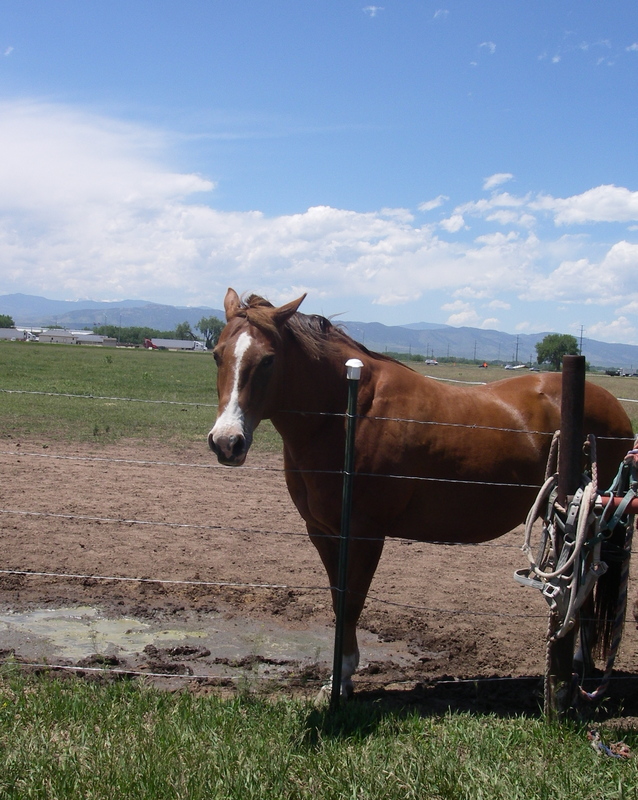 All the horses of the herd, not just the Oldsters were loosely organized in a large circle around Bud, watching. Pepper and her friend Chickadee, eyes laser focused toward Bud, but from a slight distance. It was Amigo who remained by Bud’s side. I took Pepper in to feed her while we waited for our vet to arrive. At that point, some of the other horses let go of their vigil. 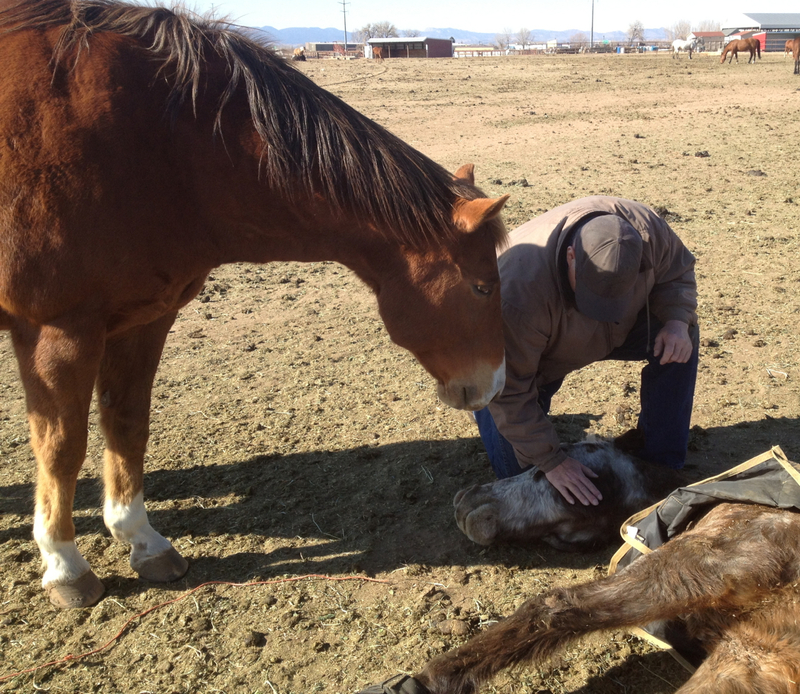 And stayed until our vet was able to get Bud on his feet so that Rick could walk him in. He stood at the gate and watched. By and by all the other horses returned, gathering at the fenceline. They stood, ears pricked, faces alert, muscles tense. And they stayed until Bud took his last breath. Only then did they disperse. knowing somehow that he’d done all he could. He’d lived up to his name – a friend to the end. I like to think of myself as a good friend. Not perfect, you understand, but good enough. 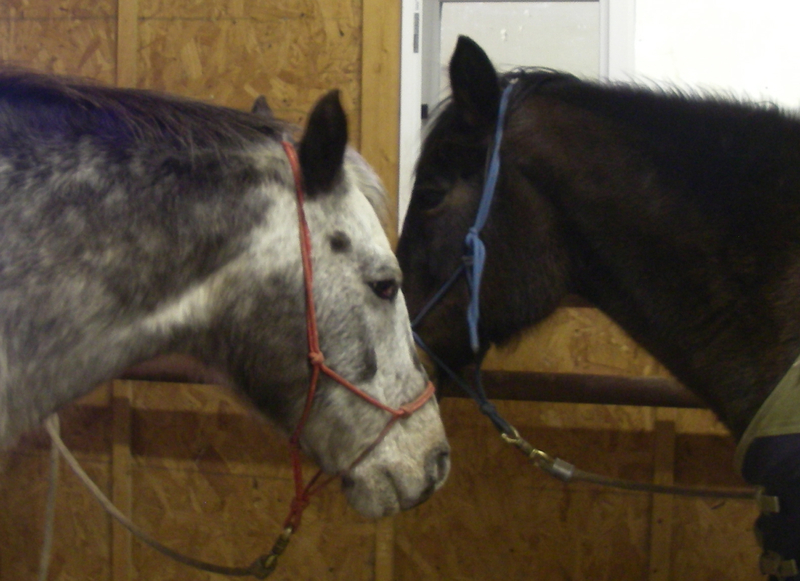 I’m extremely fortunate to have a core group of friends in my life – horse and human – that enrich my days. I hope they (you) feel the same about me. 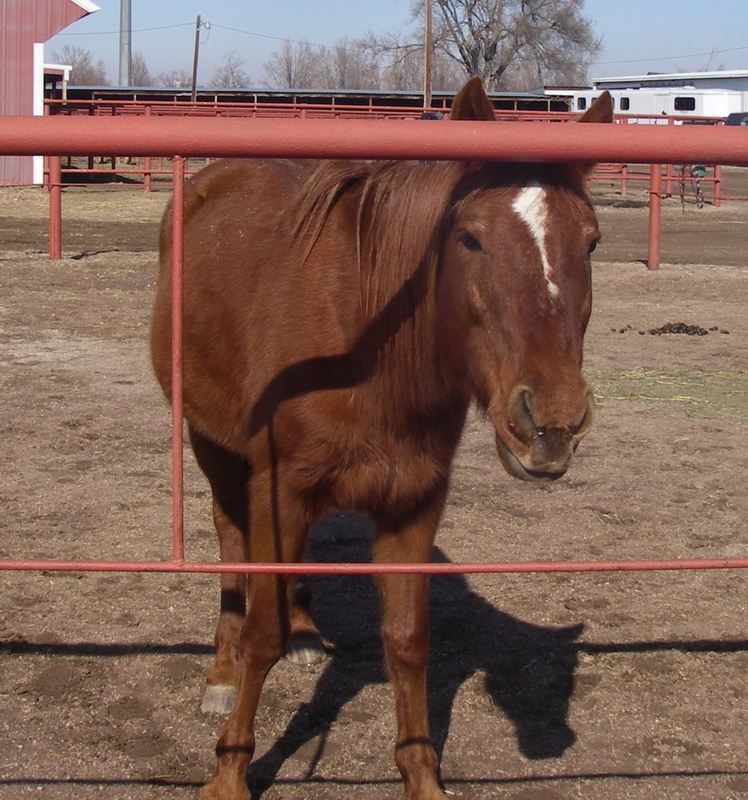 Yesterday when I was out feeding our two old sweeties I noticed a sorrel mare alone in the nearby round pen. On closer inspection I saw that it was Minnie. I first introduced you to Minnie back in September when she moved into the pasture. We dubbed her “Skinny Minnie,” for obvious reasons. Her little ribs were showing through her coat. Minnie has a sweet, shy disposition. But she’s also quirky, with a ton of personality. Once she became accustomed to the herd, she quit hanging with the Oldsters. I hadn’t seen her in many months. But she hadn’t forgotten me. As soon as she figured out who I was, she nickered a greeting. It was a throaty rippling sound that seemed almost mournful. I’ve already told you what a sucker I am for nickering. Once I got Bud and Pepper settled, I walked over to greet my little friend. 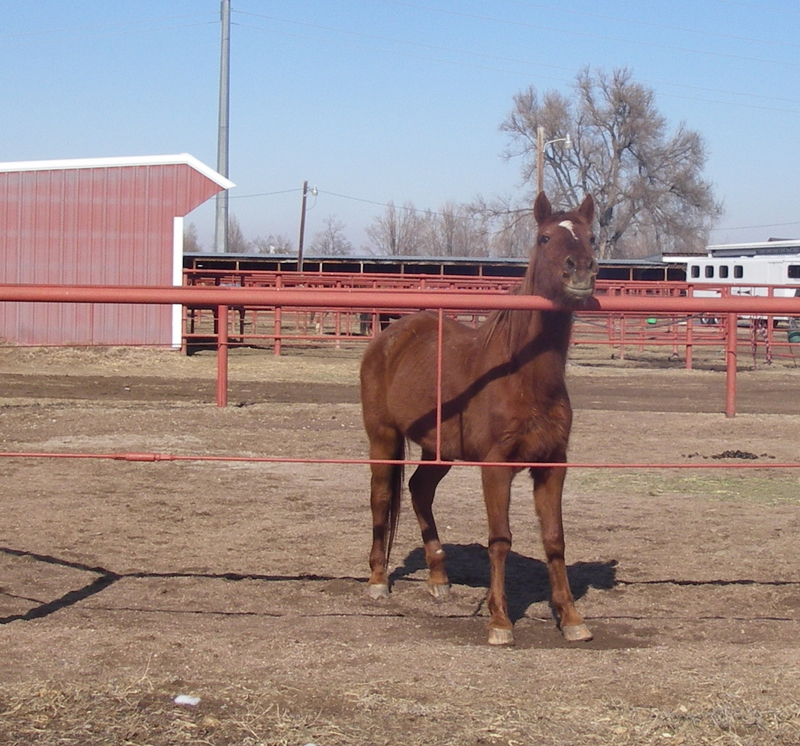 She looked rather forlorn all by herself in the round pen, and seemed really glad to see me. I stroked her neck and talked to her. We got caught up as best we could. She knew I was the “treat lady” but I didn’t feel comfortable feeding her. I wasn’t sure why she’d been removed from the herd and sure didn’t want to cause a problem if she were sick. She wasn’t really okay with that plan, but I stuck to it. She watched me take care of Bud and Pepper, and hand out treats to the Herd of Oldsters. I felt quite guilty, but knew I had to stick to my guns on this one. I tried to explain it to Minnie, but she wasn’t buying it. She just stared at me, sometimes pawing the ground for emphasis. Have you had the experience of knowing a right action wasn’t the one others liked or wanted? It’s always a challenge for me because I like to make people (and horses) happy. Though I will say that in the end, I felt good about the decision. Doing the right thing brings its own rewards. And as for Minnie, I’m confident our friendship is stronger than a handful of hay cubes. One day last week after I’d finished feeding my two old sweeties, as I drove away, I stopped to close one of the gates I’d come through. Once I’d secured the latch, I watched the herd of oldsters, curious about what they do when I leave. They shuffled around the area where I’d fed them, and then began a single-file trek down the lane toward water or another part of the pasture. On this day, Red was in the lead, followed by Baby, Amigo and Chickadee. Bud brought up the rear. Bud took a few more steps and then stopped. He looked back at Pepper, then toward the herd, which had continued to move away. He turned and walked to join his friend. This is where my heart melted. I know I’m putting human emotions on horse actions, but you’ve noticed I do that sometimes. And this was such a tender gesture. It was as if Bud didn’t want Pepper to be alone in the shed. These two have been together for nearly twenty years. They’re best friends. And it is so very comforting to be with someone who has known you forever. You don’t have to go to the work of learning about each other. That dance can be exhausting, though granted, it is also rewarding. But old friends know you and love you in spite of your quirks. They love you – warts and all. As a girl of eight, I had no idea what the song really meant. I was young on the planet and everything and everyone was new to me. I hadn’t yet learned the sweet comfort of old friends. These days, it’s a different story. I totally understand how old friends are pure gold, and new friends are all shiny and silver. As for Bud and Pepper, they’ve known this all along. I shouldn’t be surprised! P.S. This is Bud’s week to shine. 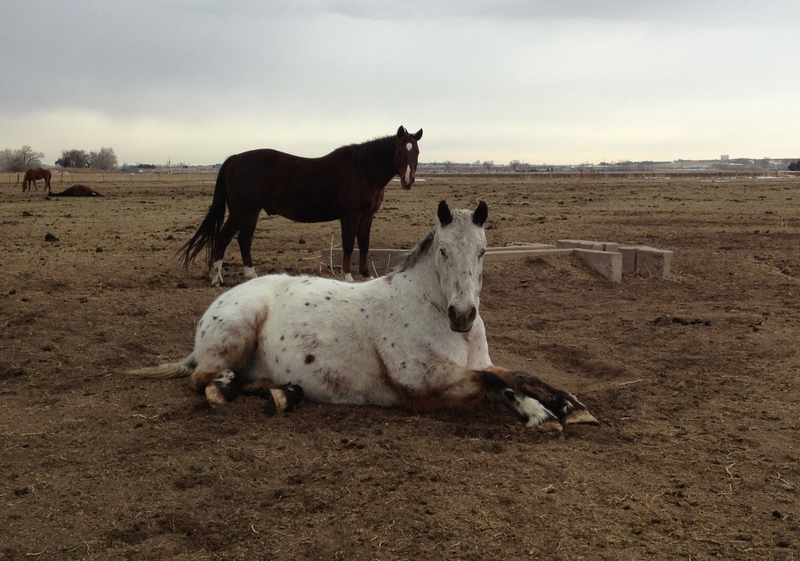 All week I’ll share stories and photos of our personable Appaloosa. On Thursday he has a big birthday, and you’re not going to want to miss the celebration! 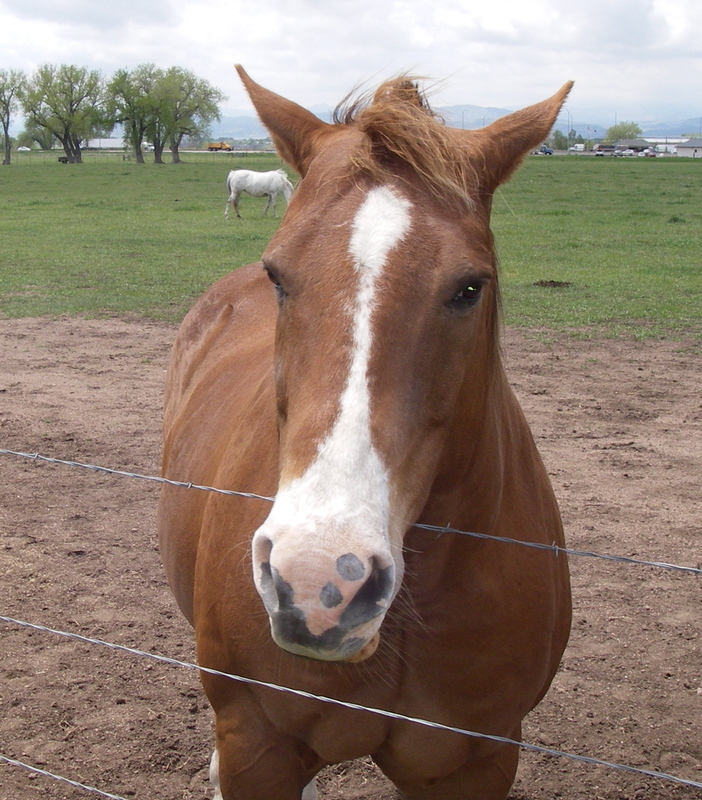 Bud’s best friend these days is Amigo – a sorrel gelding with a white blaze on his face. He has two round black circles on his nose that make him look kind of cute and goofy at the same time. When we first met Amigo, Rick was calling him “Colon Nose.” You can bet I stopped that right away! Amigo earned his nickname because of his loyalty. He’s one of those friends who is always there. He’s a horse you can count on. I don’t know this for a fact, but I’m pretty sure that Amigo pumps iron. He must have a gym membership somewhere, because this boy is ripped. Even his muscles have muscles. He’s younger than his friend Bud, and the difference in their muscle tone is obvious. Sorry Bud, but it’s true. Amigo is younger by at least ten years. He could easily be the leader of this herd and frankly kick the crap out of anyone who challenges him. But he yields to Red, the mustang who is the herd boss. Amigo seems content in his place as second in command. I think he protects Bud and I love him for that. One day last spring when we were in the pasture, we saw Amigo being led by one of his people. He was carrying two little girls on his back. As we got closer we saw that he had an orange cone-shaped birthday hat strapped on his head. “Is it Amigo’s birthday?” I called out as we drove past. The young woman leading him shook her head. “No. Today he’s being a unicorn.” The little girls riding him giggled. I couldn’t help but smile along with them. It was pretty sweet. I nodded, as if to assure him that his secret was safe with me. It’s a good thing he doesn’t read this blog. Here’s this big, muscular horse pretending to be a unicorn and carrying two little giggling girls around the pasture on his back. I totally fell in love with him at that moment. I think it was the look on his face. What’s not to love about Amigo? He’s loyal, handsome, strong, and has a good sense of humor. He’s a wonderful friend. Bud’s lucky to have such a friend. It makes me think about my friends and feel deeply grateful to have each one of them in my life. How about you? Do you have an Amigo?